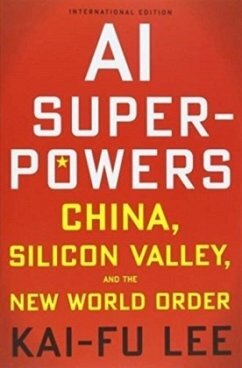 THE NEW YORK TIMES , USA TODAY , AND WALL STREET JOURNAL BESTSELLER Dr. Kai-Fu Lee-one of the world's most respected experts on AI and China-reveals that China has suddenly caught up to the US at an astonishingly rapid and unexpected pace. In AI Superpowers , Kai-fu Lee argues powerfully that because of these unprecedented developments in AI, dramatic changes will be happening much sooner than many of us expected. Indeed, as the US-Sino AI competition begins to heat up, Lee urges the US and China to both accept and to embrace the great responsibilities that come with significant technological power. Most experts already say that AI will have a devastating impact on blue-collar jobs. But Lee predicts that Chinese and American AI will have a strong impact on white-collar jobs as well. Is universal basic income the solution? In Lee's opinion, probably not. But he provides a clear description of which jobs will be affected and how soon, which jobs can be enhanced with AI, and most importantly, how we can provide solutions to some of the most profound changes in human history that are coming soon.